31. Grace helps me celebrate their victories and accomplishments as if they were my own. 32. Grace helps me refrain from competing with my spouse and see that we’re on the same team. 33. Grace helps us become one flesh in physical, spiritual and emotional intimacy. 34. Grace helps us be naked and not ashamed. 35. Grace gives us the ability to love from a pure heart. 36. Grace working in our marriage insures that it is God who is at work in both of us and not just ourselves. 37. Grace helps us remember how much we have that we don’t deserve. It is the free gift of God. 38. Grace helps us approach God’s throne for help in our time of need. 39. Grace helps us resist sexual temptation and adultery. 40. Grace helps us break sinful habits and walk in freedom. 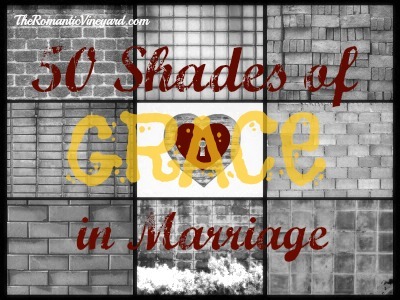 This entry was posted in Christian Marriage, Growing Strong Marriages, The Gospel & Marriage and tagged 50 Shades of Grace, 50 Shades of Grace in Marriage, Christ, Christianity, Divine grace, Emotional intimacy, Grace, marriage, Religion and Spirituality, Theology. Bookmark the permalink. I have enjoyed reading all of the 50 Shades Of Grace series, but Part 4 really speaks to me today. Thank you for sharing.